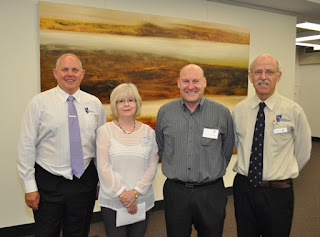 A theme I have talked about in many of my previous blogs, has been around CQUniversity being an engaged university, and the many ways in which we work with our communities to give back. In fact just last week I talked about engaging communities through our research efforts. So in staying with this theme I thought this week I could use this opportunity to let you all know about the CQUniversity art collection. I am sure when many people think about CQUniversity (or any university for that matter) they would think about libraries, computer labs and classrooms. Of course we have these, but what many people don’t know is that CQUniversity is also home to an incredibly extensive collection of art – all of which is accessible to our local communities – right across our entire campus network. CQUniversity started this collection in the 1970s and has since acquired artworks through purchase, commission, and donation. This collection represents huge value for the university (and the community) not just in terms of monetary value but also its historical and cultural significance to the Central Queensland region. Made up of almost 600 pieces, mainly from Australia, it includes paintings, ceramics, sculptures, photographs, crafts and prints. It really is a truly outstanding collection and without a doubt would be envied by any gallery or museum in a capital city. While we don’t have a specific art gallery space at the University we do make these works available to the community through public displays, publications and by loaning various pieces to other organisations for display, such as regional art galleries and other universities. This approach not only opens our collection up to national and international audiences but also allows us to engage through the sharing of art. Engaging audiences and communities through art also promotes a rich cultural experience – particularly in regional areas where we generally don’t have the same level of access to the arts that our city neighbours do, and it also allows us to inspire education and new creative pursuits among our audience members. I would also even go as far as to say that this is one of the University’s most significant scholarly resources, and demonstrates our commitment to and leadership in the study, patronage and advancement of the arts – not just locally but across all of the communities we serve. CQUniversity is very fortunate to have this collection, as are the people of Central Queensland - because it belongs to you too. More work is currently being done to further improve public access to the collection and as this comes to fruition going forward, I hope many of you will take the opportunity to behold the collection and become involved in its future. It is a real asset to our region, not just at present but for many generations to come. It is also timely that I highlight our art collection today as this morning we were lucky enough to unveil a Richard Dunlop artwork Iron Ore 2, which he donated to CQUniversity personally under the Cultural Gifts Program. Richard decided to donate the painting in memory of his father Herbert George Dunlop, who was born in Rockhampton and lived there until he was an adult. 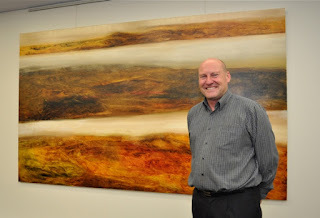 Richard also chose the space in the Bruce Hiskens Library on the Rockhampton campus where the artwork will now be displayed. I’d like to thank Richard on behalf of CQUniversity and also the local community for this donation and invite you all o visit the library and enjoy this spectacular painting.